I love glazed pots, and it’s easier to justify buying them even if you don’t have a tree for them in because they look just as good on the shelf as on the bench. And this feature comes in handy, since many of the more outlandish pots you’ll find are difficult to match with a tree. A glazed pot is not the same as a painted pot. Glaze is essentially a slurry of dry ingredients suspended in a liquid medium (usually water). Glaze generally has a minimum of 3 components. Silica usually comprises that majority of the glaze, while a second ingredient (generally a metal oxide) acts a flux to lower the melting point of the silica. A third ingredient, Alumina, is added to affect the glaze’s molten viscosity (and keep it from sliding off the pot). Finally one or more chemicals can be added to produce a range of colors when fired. So at the end of the day, glaze is basically glass, that when brought to a high enough temperature, melts and bonds to the clay of the pot. While the original function of glaze was likely to waterproof clay products, today they’ve taken on a mostly artistic purpose. Today in the world of bonsai there are many popular glazes: cobalt blue (ruri), white or cream (shiro), yellow (kii); as well as more unique colors like blood red or pink. In addition to the standard, single tone glazes, there are also potters that use layering techniques and specialty glazes to create beautiful effects in the kiln. Often you may hear the term Yohen or kiln change glaze, which refers to really any technique in which the glaze changes in the kiln during firing. Sometimes this may mean adjusting the heat or the duration of firing to achieve a certain effect. Other times it may involve layering specific types of glaze on a pot so that an under-glaze bubbles up through an over-glaze. Or this could mean that the glaze changes color or shape during firing. There are really endless techniques, and seeing as how some of the best potters in Japan develop their own glazes, the possibilities are endless. If you spend any time looking into glazed Japanese bonsai pots, you’re likely to hear “Oribe” over and over again. 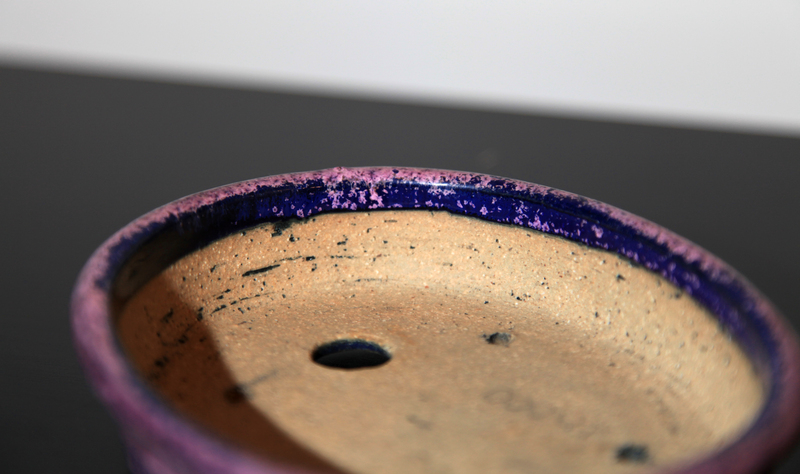 Originally Oribe referred to a type of pottery (not just a glaze) produced in Japan as early as 1600. During Japan’s Keicho period (late 1500’s- early 1600’s) general and tea master Furuta Oribe promoted his preference for tea bowls that were flawed in some way, either in shape or coloring. The traditional Oribe pottery combined iron oxide and copper green colors to create asymmetrical designs in this tradition. 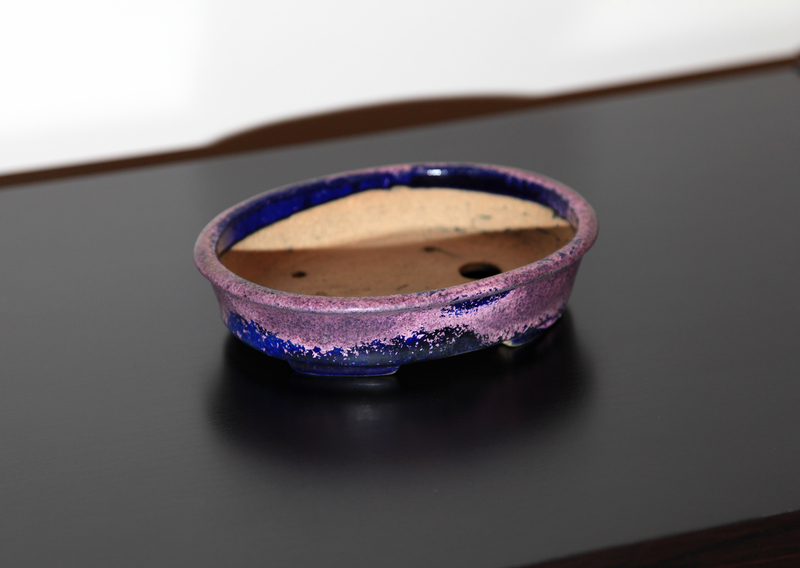 The traditional Oribe glaze used feldspar, oak ash, and 1-10% copper oxide. Now days, Oribe refers to a glaze color that is generally made with copper carbonate as the colorant. At modern day concentrations around 5% this generally leads to a bright transparent green color. Using copper concentrations of .5 to 2% yield blue, and concentrations above 10% can yield black when fired correctly. You are likely to see a variety of colors in Japanese Oribe pots, and this is in partially controlled by the concentration of the copper component in the glazes. If you didn’t read the evolution of Oribe post on Nebari bonsai (with the help of Ryan Bell) check it out here. 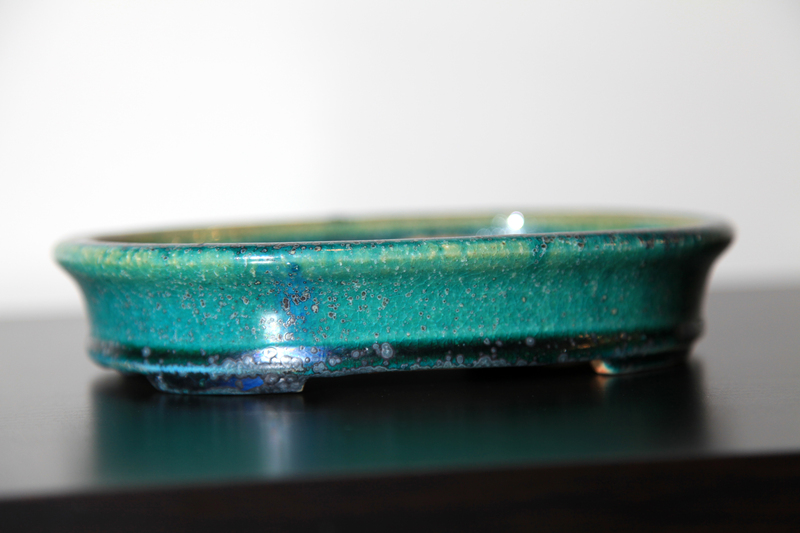 The really cool thing about the Oribe glaze is that it packs a little surprise. 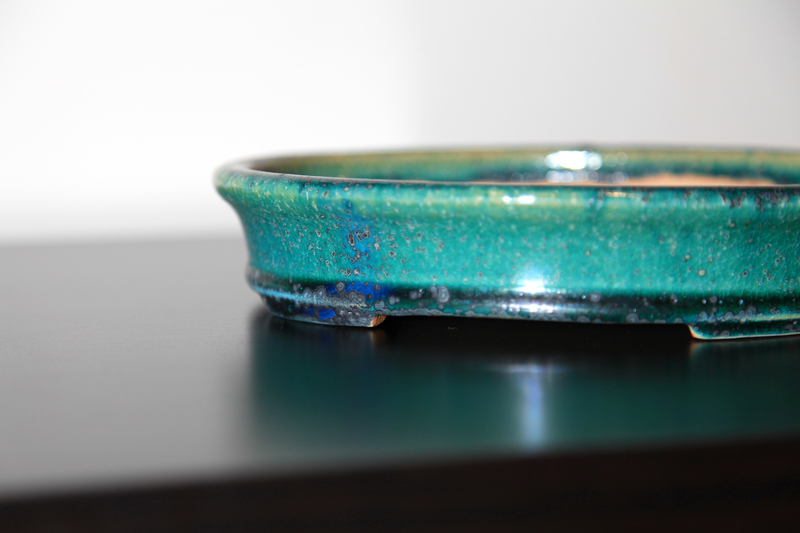 Oribe glaze is generally a high firing glaze, usually cone 9 (around 2,300 F) or above. 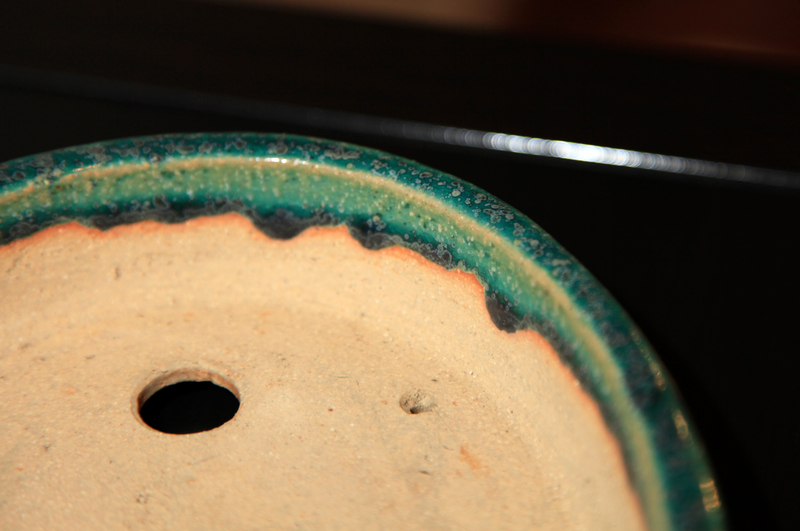 When the Oribe glaze is fired in an oxidation kiln (in which there is enough oxygen to supply the burning fuel) the glaze turns out green with occasional highlights of blue. 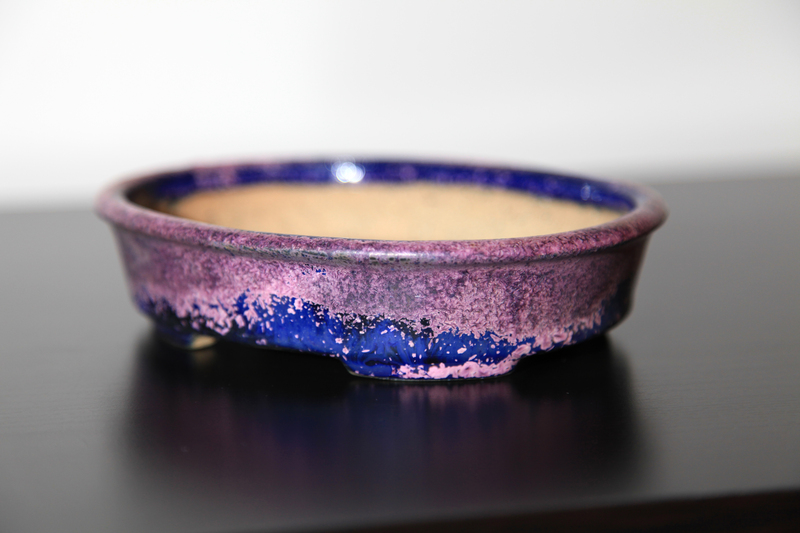 If you fire the Oribe glaze in a reduction kiln (in which there is not enough oxygen in the kiln to supply the fuel) the flames will pull oxygen molecules out of the glaze and the clay, thus changing the glaze and leaving it a lovely red with pinkish highlights. You’ll notice that many Oribe pots have small grey specks throughout, almost as if someone has sprayed them with white or grey. After looking into this a little further, I’m almost positive this due to one of two techniques. One possibility is carbon-trapping. 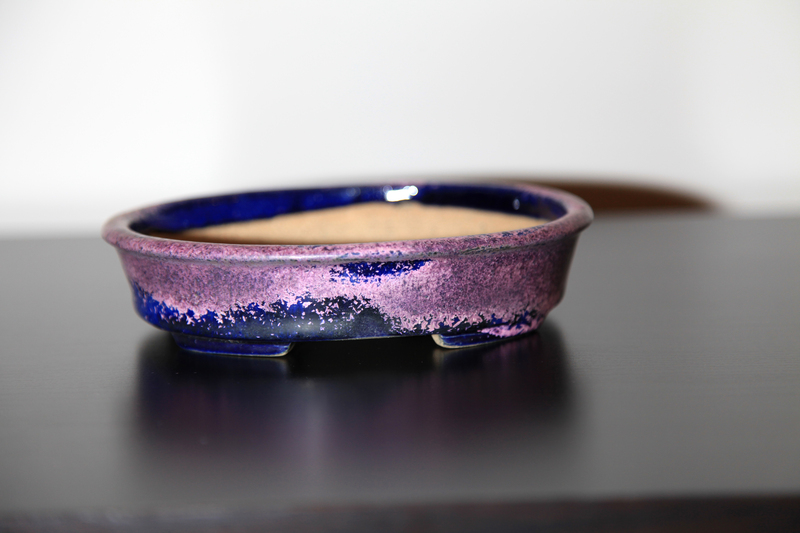 The original Oribe-ware used this technique (likely by accident) as well as the older Japanese Shino glazes. Unlike most glazes (a slurry of insoluble dry ingredients) Shino glazes have a high proportion of soda ash, which is soluble in water. During the firing process the sodium from the soda ash traps bits of carbon from inside the kiln. As the glaze dries these trapped bits of carbon float to the surface of the glaze and produce the attractive grey or black imperfections. This effect can be produced even without using glazes containing a sodium element. 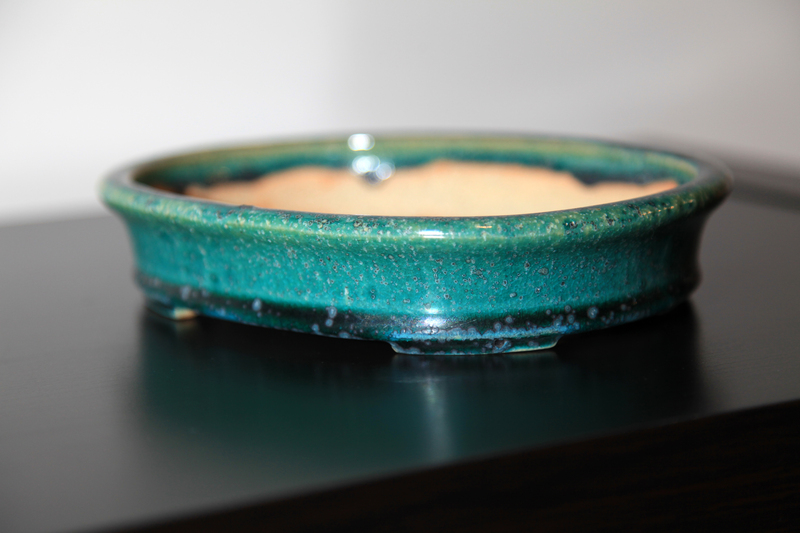 If you do not use a sodium containing glaze, the kiln must be force-fed smoke and ash so that bits stick to the molten glaze, and are trapped by the time it starts to harden. Usually carbon trapping creates black spots that are flat. Since the occlusions on this pot are raised my feeling is that it is more likely a type of leaching. This happens whenever chemical elements burn out of the clay or glaze during the glaze firing. The bubbles that this gas creates are trapped at the surface in the form of pinholes. The second possibility, and you’ll have to look very closely at the piece in question, is the formation of crystals in the glaze. I say you’ll have to look closely because usually these look like little snowflakes instead of specks. From what I can gather about glaze crystals (from my scouring of pottery forums and the book The Complete Guide to High-Fire Glazes: Glazing and Firing at Cone 10 by John Britt) they are formed during the drying process in the kiln. Basically what happens is you start out with a pigment over-saturated glaze. This means that the colorant agent (copper in Oribe) takes up a high enough percentage of the glaze (some forums have indicated 10% or more in Oribe glazes) that it becomes over saturated, and given enough time the colorant solids will fall out of the glaze solution. This effect is achieved when the kiln is cooled very slowly, allowing the glaze to remain in liquid form for a longer period of time. During this extended time the over-saturated elements will fall out of solution and crystallize back into solids. When the glaze hardens they will be stuck in the glaze. If you click one of the photos below you can probably see that the light pinkish areas of this pots are formed using this technique. Up close it looks like frost on a window. The exciting bit about Oribe glaze and others like it, is that no matter how skilled the artist, you can never completely predict what the finished product will look like. As I mentioned in the last post I’ve been on a bit of a pot buying spree. As with the other pot I bought, these two are Koyo. The Hanko on these is from the “second tier” of Koyo pots, and are made at his home. Excellent and detailed article. Well done. Fantastic information! I was crawling for it a while. I have one question about Koyo´s 1st Gen. “second tier” Hanko. You wrote “at his home”, but I only know the large Koyo toen. Does the Kouichirou family run several kilns? And do you have comparable information about pots with the “Ginko leave” Hanko (i guess, first tier pots)? Hey Dennis, Thanks for the comments. I’m not 100% sure about my comments on the Koyo Hanko. I believe at the time I did most of my research on Ryan’s excellent website: https://japanesebonsaipots.net/. 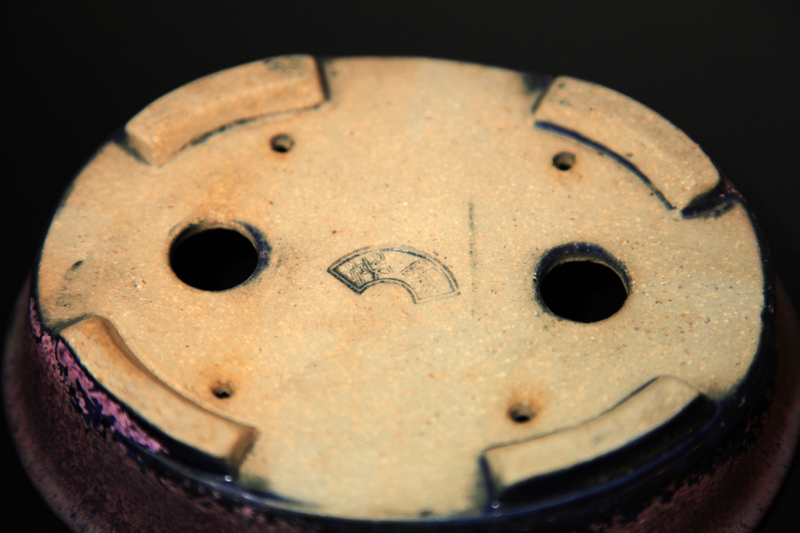 I believe you are correct about the “tiers” of the various Hanko, though if I remember correctly that specific Hanko may also reference pots made for a specific purpose/nursery (its been a few years since i’ve done research on this but it seems to me like that may have been the case). Thanks for your replay! 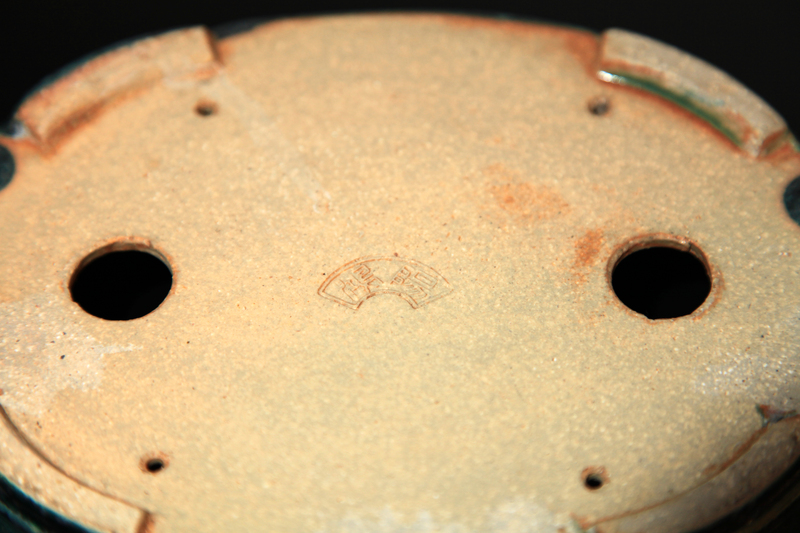 What I´ve sometimes seen on Koyo pots was the stamp from the “Fuyo En” nursery (above the Koyo Hanko). I think these are two different things, pots commissioned by Fuyo En, and pots Aiba himself relates to a tier. 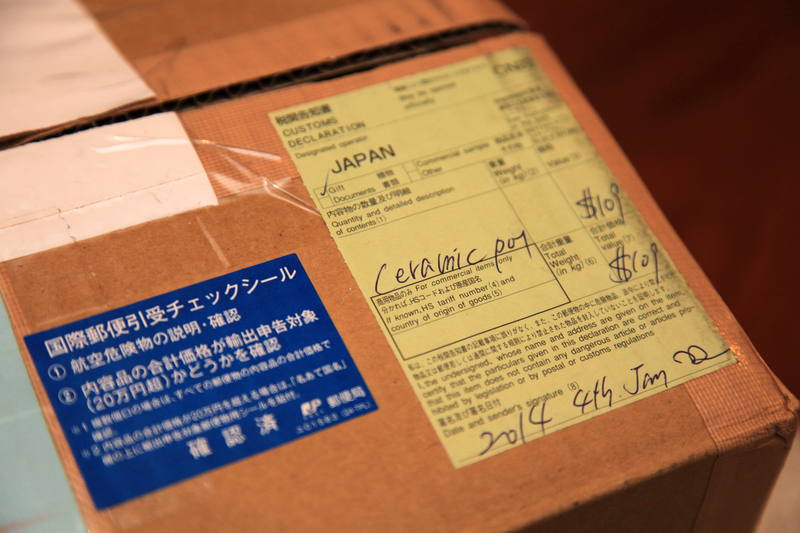 However, it´s always fun to watch Koyo pots, even the production grade pots.